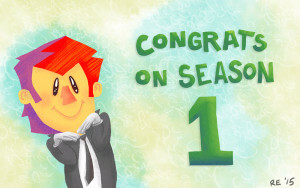 On an unrelated note, my pal Connor just finished up season 1 of his horrible web series, Khonjin House. (Parental advisory [this means it's a warning to my parents]: it’s full of potty words so you won’t like it). Anyway, I drew this to celebrate. On yet another unrelated note, did you know that the California Raisins are coming back in a live-action/CG feature film?! Nothing like dried fruit on the silver screen to get your bowels moving. Ciao!